St Clare was born the eldest daughter in a devout Christian family in Assisi, Italy. Prayer was central to their family life. 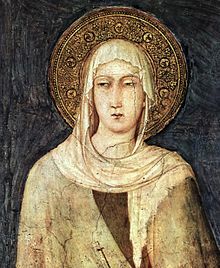 St Clare opted against marriage and, with the advice and help of St Francis of Assisi, secretly joined a Benedictine Convent. Her father made several attempts to have her forcefully returned home and marry but he was unsuccessful. She, “clung to the altar of the church and threw aside her veil to show her cropped hair” and insisted that “she would have no husband but Jesus Christ”. St Clare was joined by her sister Agnes and other like-minded followers at the Convent. They practised an enclosed and extremely austere life; filled with daily manual labour and prayer. They became known as the “Poor Ladies”. The Poor Ladies were initially directed by St Francis of Assisi but in 1216, St Clare was appointed their Abbess. She defended the exceptionally strict rules of the Order while St Francis continued to act as her Spiritual Director. The Poor Ladies cared for St Francis during his illness prior to death. Following St Clare’s death, the Orders name was changed to The Order of St Clare in her honour. Today, its members are commonly referred to as the Poor Clare’s. St Clare’s Feast Day is the 11th August. She is the Patron Saint of eye disease, domestic and textile workers, and Santa Clara Pueblo in New Mexico. Pray for us that we will accept God’s plan, follow His directions and avoid the world’s many material distractions.